Romantic Get-a-Way!! 1954 Rail Road Caboose!! Relaxing Hot Tub! Voted the BEST Romantic Get-Away in Wisconsin!! New Lower nightly Rate! New Hot Tub installed.... and a new Futon Bed! Comes with a relaxing Hot Tub tucked in a Gazebo surrounded by the beauty of SW Wisconsin. 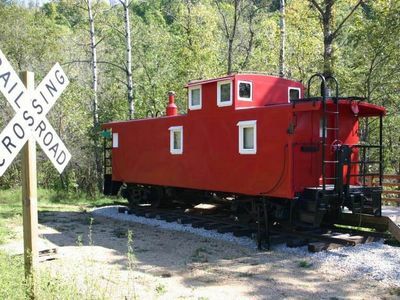 Relive the old railroad days in this original 1954 Rail Road caboose! History at it's best! Secluded on five acres, this caboose features a kitchen, bath, gas fireplace(in Winter) and a private deck! Sit in the cupola of the caboose and read a book or scope out the wildlife from the wrap around view. We are just walking distance from a Class A trout stream. Fish or Dangle your feet in the cool flowing waters. Ask about our Guided Kayaking, or Ice Climbing trips to add some Adventure to your get-a-way stay! Enjoy a relaxing dinner at the best local restaurant- The Great River Roadhouse- overlooking the Mississippi River! Sleeping is on a double size futon and bunks. Will sleep up to four people (two to three adults and a child). This perfect for a couple or small family with young children. Check-In is 3PM, Check-out is 11AM. Weekly bookings are Friday to Friday. ALL Reservation deposits are non-refundable. Refunds after final payments are made will only be given if we can re-book the dates that are canceled. Note: The caboose is now a SELF cleaning cabin with NO cleaning fee. If it is not cleaned by you at the end of your stay a charge of $125 will be assessed. You will need to clean it up at the end of your stay and provide your own linens(full size or twin), towels. This will save you. Pontoon Boat and Fishing boat packages on the Miss. River are also available. Ask our manager for more details. HUGE DISCOUNT DEAL: Many guests ask for discounts for last minute most of our bookings are LAST Minute so we can not offer last minute deals BUT we are offering guests who book EARLY a deal! Here it is: Get 5% off your rate for EVERY MONTH in ADVANCE that you reserve with Payment in Full! Example- book 4 months early- get a 20% off deal! 3 months get 15% off, 2 months get 10% etc. FULL payment MUST be paid at least the number of months ahead of time for deal to apply. Max. discount is 20%(or 4 months) Guest must mention this deal at Time of Booking ONLY to get the deal. Thanks! Holiday bookings require a 3 Night minimum.....Memorial Day, Labor, Day, 4th of July, New Years. Normally this is not a problem, BUT if you need to cancel your trip (especially at the last minute), you should know that you may forfeit a portion or all of your rental fees. Book Now - Dates are filling fast! Thanks!